The Golden Gate Bridge is one of the most famous suspension bridges in the world. The bridge, which connects the city of San Francisco with Marin County, spans the opening of the San Francisco Bay into the Pacific Ocean, also known as the Golden Gate. The bridge made of steel is a total of 8,981 ft long. This favorite tourist attraction’s toll costs up to $6 a car. Construction for this Wonder of the Modern World, as it was named by the American Society of Civil Engineers, began in January of 1933 and lasted 4 years until its completion in April of 1937. Prior to the building of the bridge, the only form of transportation that connected the two sides of the bay was a ferry service. The trip from one side to the other cost $1 per vehicle and took around 20 minutes. 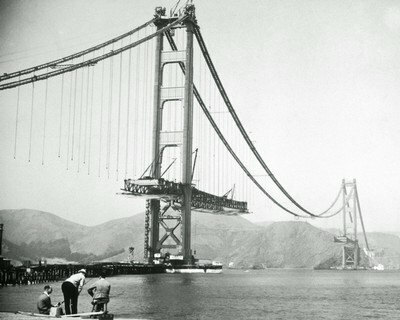 Construction of the Golden Gate Bridge, which has since been designated as a California Historical Landmark, ended up costing around $35 million to complete. Incredibly, 75 years after opening, the bridge accommodates daily traffic of around 110,000.